Strawberry Fields at Ellwood Thompson’s! Strawberry Fields is proud to be a part of our community! 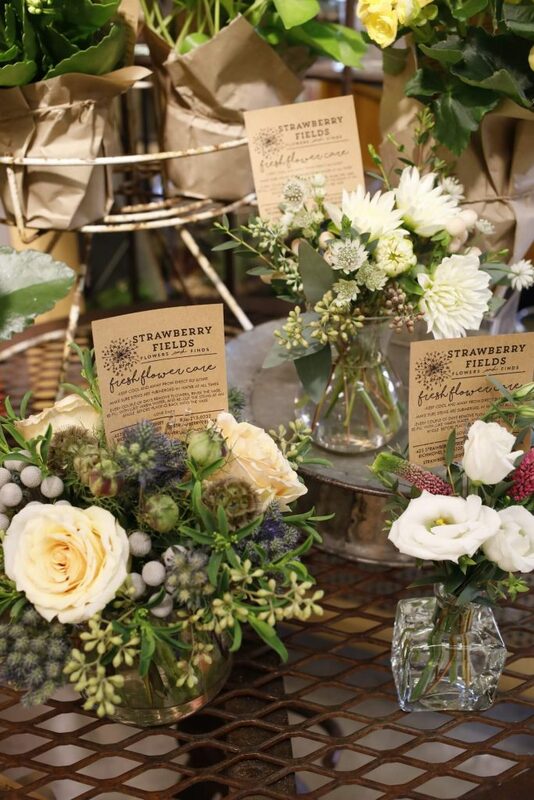 Starting in November of 2017, we were given the honor of creating our own floral department at Ellwood Thompson’s. As of December, we were asked to provide a taste of our locally made gifts too. Now, we have an additional terrarium & gift area in the produce department. How did we get so lucky? We are thrilled to be showcased in such an amazing Richmond icon & working with so many great folks. 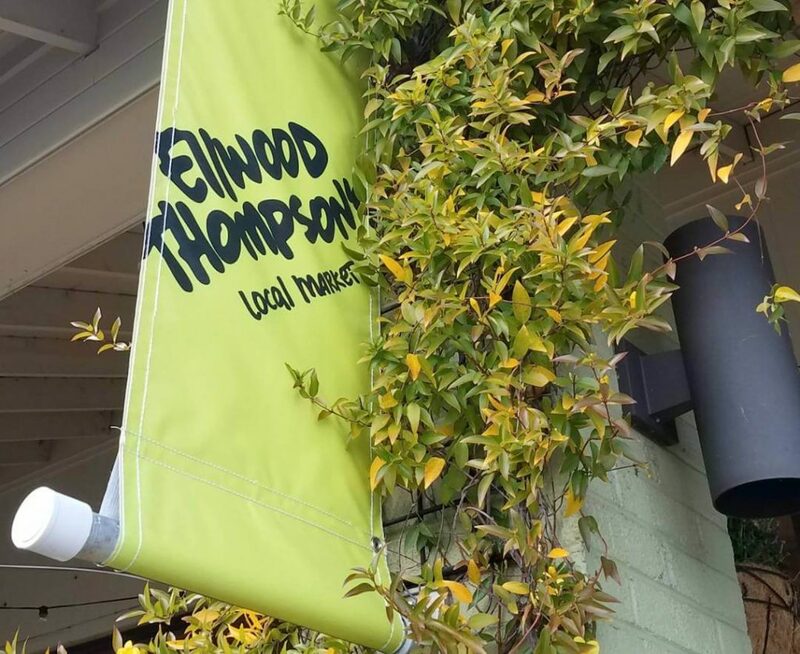 Check us out next time you are shopping at Ellwood Thompson’s! Thank you for your support. Last year we started a new tradition at Strawberry Fields. On small business Saturday we offer dog photographs with the Grinch right outside the shop. All photos are free but we accept donations for local animal shelters in the Richmond area (This year we did AARF!). Thank you so much to those of you who came out to support us on small business Saturday! We hope everyone enjoyed their doggy photographs as much as we did! The 2017 Wedding Season is officially over! Congratulations to all of our lovely couples- we wish you all the happiness in the world! There is a certain ethereal quality to the beautiful, curly leaves of the tillslandia plant. The muted grey tones often help to compliment a moody arrangement of flowers or offer a lightness when working with pastels. These textural gems were the perfect addition to a recent collaboration with two amazing local creatives. The instantly recognizable photography of A Girl Named Leney put some of our favorite air plants front and center with some stylish and cool toned linen pieces from Yesterday’s Heroes. The perfect balance of lightness and shadows, we will let the photos tell the story.. Thank you for taking a look..be sure to stop in and grab your own sweet air plant to take home! These crisp, cool autumn days will soon give way to those icy winter mornings and frost covered trees. Though, stepping into the shop this week you might think we forgot it is only November. Those familiar holiday scents and colors seem to be popping up in our windows and displays. We wanted to give a little behind the scenes look into what goes on as we shift our seasonal decor with a mission to inspire your holiday decorating, shopping and spirit. In our creative pursuits we often have to start first by creating a larger mess (sorry to those folks who had to witness this chaos first hand), but there is some mild order to our massive chaos. In an effort to always keep the shop evolving we let go of some of our main fixtures and brought in a beautiful farm table with a warm, wood surface to greet our customers. 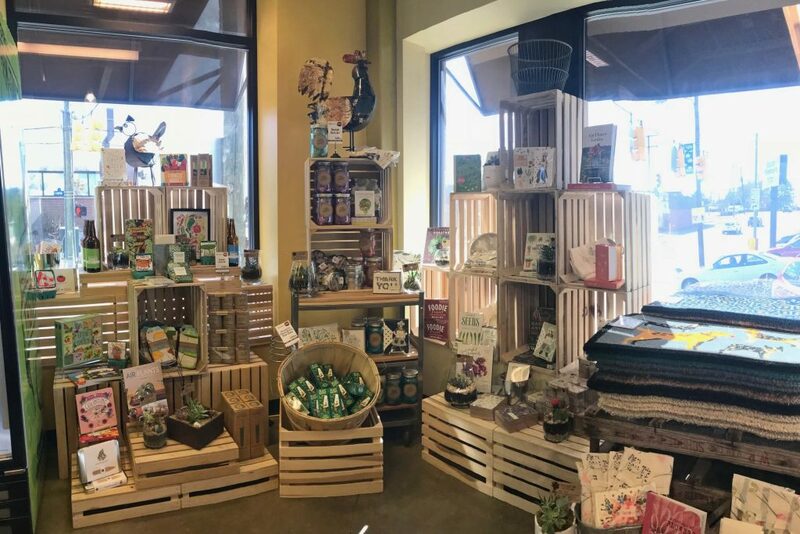 The painted and distressed base blends perfectly with our rustic and industrial aesthetic while providing ample space to display our merchandise. The farm table is setup up as a shoppable gift guide with samplings of merchandise from all over the shop. 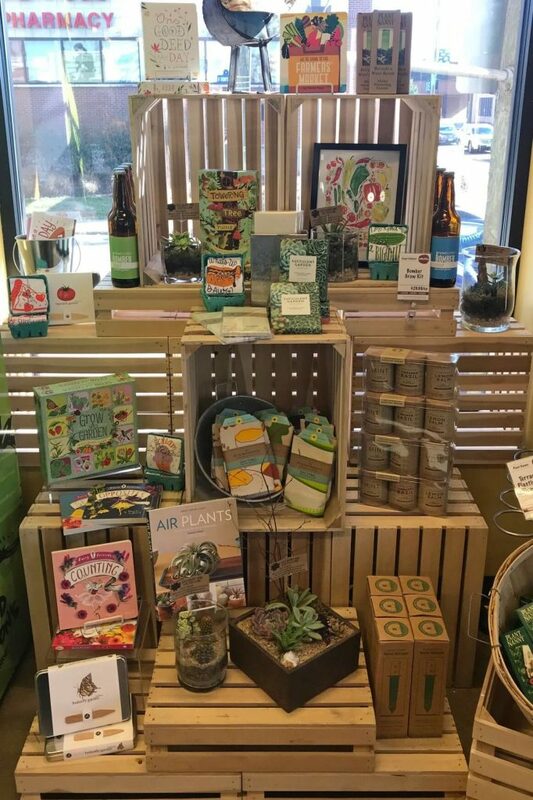 This table features the items and products we love giving as gifts, our best sellers and locally sourced goods. Week by week our gift guide table will change to help you keep crossing off all the names on your holiday list this year and provide that seasonal inspiration to create your own beautiful displays at home. 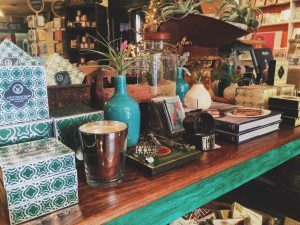 On the table you will find drool worthy cookbooks, ready to go terrariums, holiday candles, locally made soap and so many other perfect gifts (or you know, things to keep for yourself). Our woodland and rustic trees are full of unique ornaments, furry woodland creatures and plenty of sparkle. Using an assortment of metal and wire containers tucked into the trees we were able to achieve a cohesive and curated look, which is something that you can do at home when putting your own tree up! We are excited for the holiday season, but also not totally forgetting that little gem of Thanksgiving! We have tons of beautiful autumn blooms, fall foliage and gorgeous arrangements in the shop. Upcoming workshops can be found on our website where you can also sign up and reserve your spot! Stop in soon for some inspiration or for just a bit of quiet exploring in the shop. With summer in full swing I have noticed a lot of cripsy planters on porches (I’m guilty as well), but all the varieties of sedums and succulents are thriving in this heat. While your geraniums turn to dust and the begonias wilt away, take some time to check out how beautiful and full of texture succulent planters can be. Native to dry, arid climates these hearty hoarders of water are made to tolerate our southern heat waves. Before getting your hands in the dirt there are a few things to keep in mind when selecting and growing succulents. For outdoor containers you want to be sure you are selecting perennial varieties that are able to tolerate our winters. Surprisingly there are many choices out there and you can usually find them in the outdoor, perennial greenhouses at many nurseries. Be sure to inspect the plants for mold, rot and signs of over watering (leaves that are mushy or are falling off). Since succulents are extremely efficient in retaining water in their leaves you want to be sure you are using a pot with excellent drainage. Also, picking a soil that is a sandy mixture with NO water retention ingredients is very important. Succulents are unable to release excess water and tend to rot or drop petals when potted with soil that isn’t able to dry out regularly. These are great plants to use when playing with texture and shape. Mix rounded hens-and-chicks with trailing sedums or upright blooming sedum for a pop of color. You can also make a big impact by mounding all the same type and color of succulent together in a single pot. When planting keep about 2-3″ of gravel in the bottom to help increase drainage as well. Succulents love to be in a sunny spot on the porch and only need to be watered when thoroughly dry; about every 5-7 days in the heat of summer. They also winter over very nicely and are easy to propagate to create new plants. Indoor succulents can add the perfect natural element to those nooks where you want a lower maintenance pop of greenery, like the bathroom or a coffee table. These are the perfect plants to use for dry terrariums too. You need to be careful when selecting indoor succulents and keep an eye out for signs of rot, falling leaves or mold. Also picking a container with good drainage or being careful with your watering schedule is really important. Like outdoor succulents, indoor succulents thrive in a sandy soil mixture that will not hold excess water. They need a sunny spot in your home, so pick a western or southern facing window to make sure they are getting enough rays! We suggest watering them every 10-14 days with just enough water to moisten the soil. Signs of under watering are usually presented in the form of wrinkled or shriveled leaves. Succulents typically thrive from neglect and do best with little fertilizer. We always have beautiful succulent terrariums in the shop for sale and are always happy to source our succulents to plant in your own container. 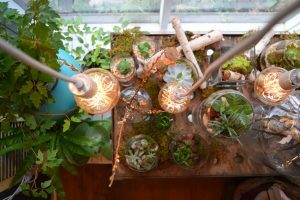 Click here to view and sign up for our upcoming terrarium workshop! We wanted to welcome you to our wonderful new website, our creative new branding and share with you our continued passion to serve the Richmond community. Over the last year we have been carefully crafting all of the details that make up our website and our natural aesthetic for our new business cards, logo, shopping bags and so much more. We have had the pleasure of working with talented, local designers to help curate a vision that will carry Strawberry Fields into the next 10 years and beyond. Being a fixture in the Richmond community has allowed us to evolve and grow into the creative and thriving business that so many of our loyal customers have made possible. As you browse our website you will see our fresh logo as designed by Sue Corral and a simple, clean layout by Midlothian Web Solutions. Our artful photos come to us from local photographers that include Jason Collins Photography, Jessica Madia Photography and Brenna Coady Photography. 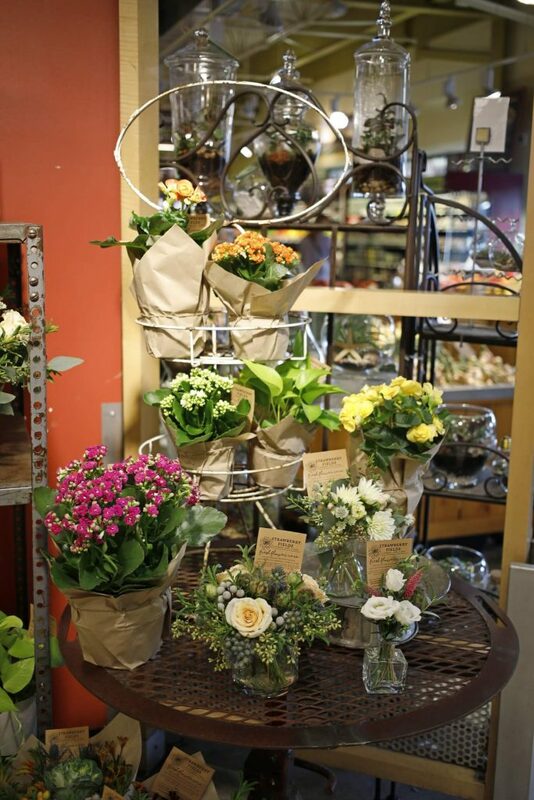 All of our floral arrangements are crafted in our shop with fresh flowers that are sourced locally when available. Our team of designers strive to create arrangements that reflect our individual style and deliver to our clients an arrangement that exceeds their creative expectations. 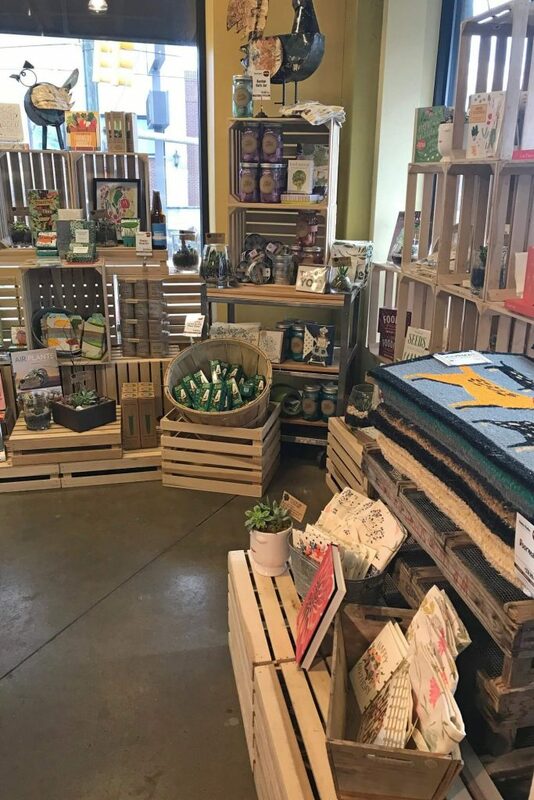 Stopping by the shop you will find an eclectic mix of locally made goods that have been sourced and hand picked by the owner, Deanna, to curate a shop that reflects a proud, artist city. A mix of vintage and industrial pieces are used by Casey as he styles our shop and maintains window displays that bring in curious customers passing by. Terrariums in found vessels are loving planted by Brenna who also keeps us informed with her beautiful chalk art updating passerby’s on upcoming workshops, holidays and seasonal happenings. Our website, our shop and our staff reflect this creative community that has been so generous, supportive and committed to our passion. It’s a commitment we have seen from the couples who married 10 years ago and continue to seek us out for their floral and gift needs, a commitment from local publications that source out creative arrangements to use in their editorial pieces and a commitment from all the local folks that discover us on their lunch break and then bring their friends by too. We hope that as you explore our new website you feel inspired and that when you visit our shop you feel at home.